Western blot analysis of extracts from 293T cells, mock transfected (-) or transfected with a construct expressing Myc/DDK-tagged full-length human CD21 protein (hCD21-Myc/DDK; +), using CR2/CD21 Antibody (upper), DYKDDDDK Tag Antibody #2368 (middle), and β-Actin (D6A8) Rabbit mAb #8457 (lower). 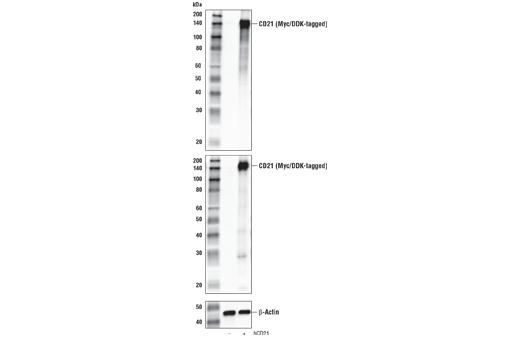 Western blot analysis of extracts from various cell lines using CR2/CD21 Antibody (upper) and β-Actin (D6A8) Rabbit mAb #8457 (lower). As expected, CR2/CD21 protein expression is not detected in K-562 cells. CR2/CD21 Antibody recognizes endogenous levels of total CR2/CD21 protein. Polyclonal antibodies are produced by immunizing animals with a synthetic peptide corresponding to residues surrounding Asp430 of human CR2/CD21 protein. Antibodies are purified by protein A and peptide affinity chromatography. Complement receptor type 2 (CR2/CD21) is a type 1 transmembrane glycoprotein whose expression is largely restricted to B lymphocytes and follicular dendritic cells (1,2). Research studies have shown that CR2/CD21 functions to bind the complement fragments iC3b, C3dg, and C3d, which function to activate the alternative complement pathway and MAC formation (3,4). In addition to its function as a complement receptor, CR2/CD21 also functions as the B-lymphocyte receptor for Epstein-Barr virus (5) and interferon alpha (6). Research studies have also shown that CR2/CD21 participates in B-cell activation, proliferation, and protection from apoptosis through its association with components of the B-cell coreceptor signaling complex such as CD19 and CD21 (7-9). Nadler, L.M. et al. (1981) J Immunol 126, 1941-7. Reynes, M. et al. (1985) J Immunol 135, 2687-94. Weis, J.J. et al. (1984) Proc Natl Acad Sci U S A 81, 881-5. Nielsen, C.H. et al. (2001) Immunology 104, 418-22. Fingeroth, J.D. et al. (1984) Proc Natl Acad Sci U S A 81, 4510-4. Asokan, R. et al. (2006) J Immunol 177, 383-94. Tedder, T.F. et al. (1994) Immunol Today 15, 437-42. Fearon, D.T. and Carter, R.H. (1995) Annu Rev Immunol 13, 127-49. Mongini, P.K. et al. (2003) J Immunol 171, 5244-54.